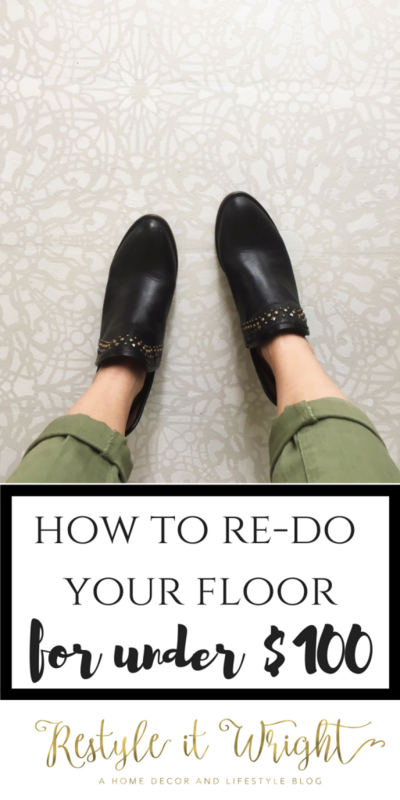 YES You Can Paint Your Linoleum Floor and a Giveaway! *This is a sponsored post. I received product from Cutting Edge Stencils in exchange for my review. All thoughts and opinions are my own. 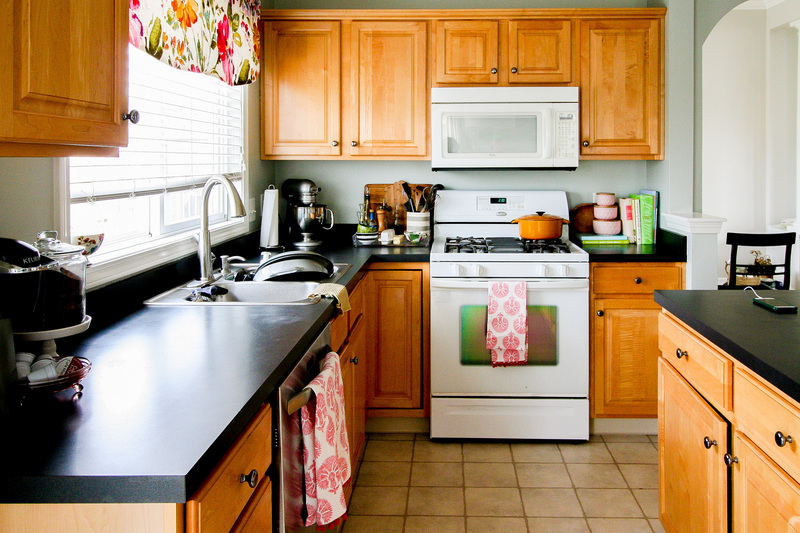 Here’s the thing about a kitchen renovation – it can be crazy expensive and time consuming. 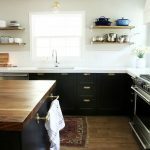 If you’re a DIYer than it can feel like it’s taking forever and sometimes there just isn’t enough time or money to replace all.the.things. But who wants to see a gorgeous new space and then look down and see a hideous floor? Surely not me. 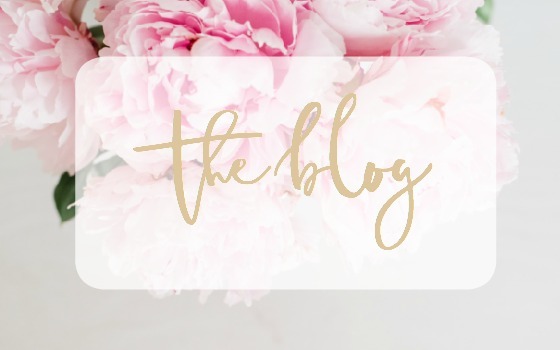 So, I did a bit of research and decided that I was going to be brave and paint the floors – what’s the worst that could happen? Eventually we will replace them and it couldn’t get any worse than we had so I decided to go for it. I’m SO GLAD I did because the outcome turned out even better than I expected and I’m so confident you can achieve great results also. The floor was disgusting from all the renovations we had done up to this point – the floor was our final step in the kitchen reno process which was intentional. I gave the floor a good sweep and mop and then got started on my first step. 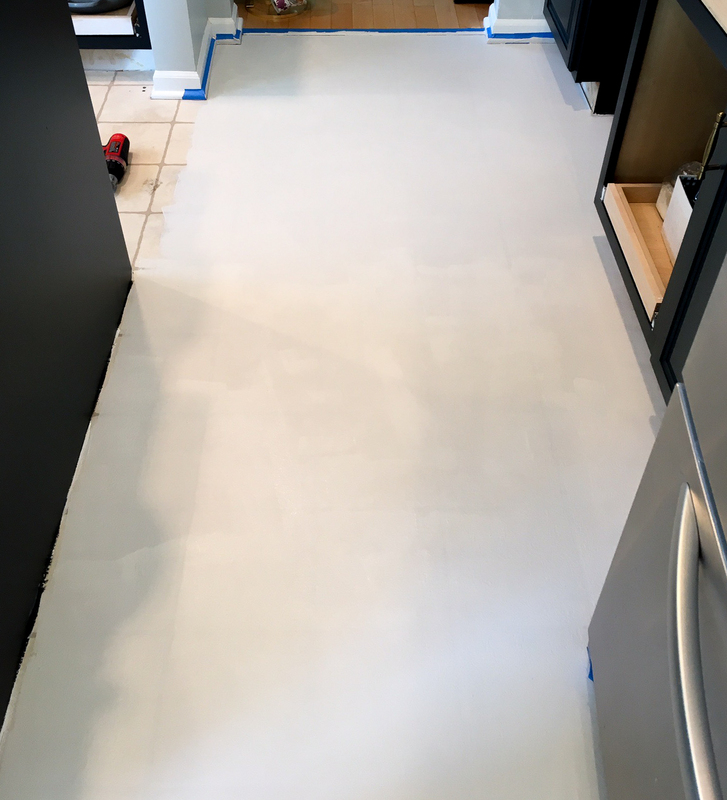 The linoleum has a shiny slippery surface to it that I didn’t think paint would adhere well too and I really didn’t want to hand sand an entire kitchen floor to get that glossy surface off. 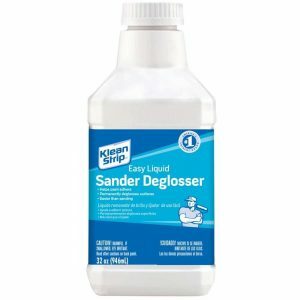 So, I spent $8 on a liquid deglosser, threw some gloves on, and with a scour pad scrubbed every bit of that floor. Due to the chemical nature of the product I didn’t want to snap photo’s while I was gloved and scrubbing but it’s just like scrubbing the floor with cleaning solution. As you scrub the solution onto the floor you’ll notice as it’s drying it leaves a slight film and is rough to the touch – it’s totally normal and that’s what it’s supposed to do. Once I was done deglossing the floor I let it all dry (maybe an hour) and came back through and swept again to remove any debris. Next it was time to paint! I did not prime the floor first but depending on your project that is something you may consider. 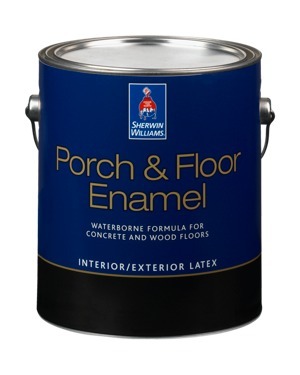 I consulted the pros over at Sherwin Williams on the best type of paint to do for the job and they recommended their porch and floor enamel so that’s what I used! I had a 40% off coupon so it came in around $40 for a gallon. I went with a color I’m pretty confident on that we have in our dining room and formal living room – Crushed Ice. I wanted a light color on the floor since our lower cabinets were so dark. So I tapped off all our trim with painters tape and got to work painting! I used a small tray/foam roller combo however a long pole/roller combo would also work if you wanted to save your knees! 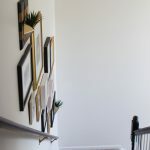 Make sure you give yourself an exit plan as you paint – I have two entrances to my kitchen so I was able to start at one end and work my way down and not have to worry about going over wet paint. 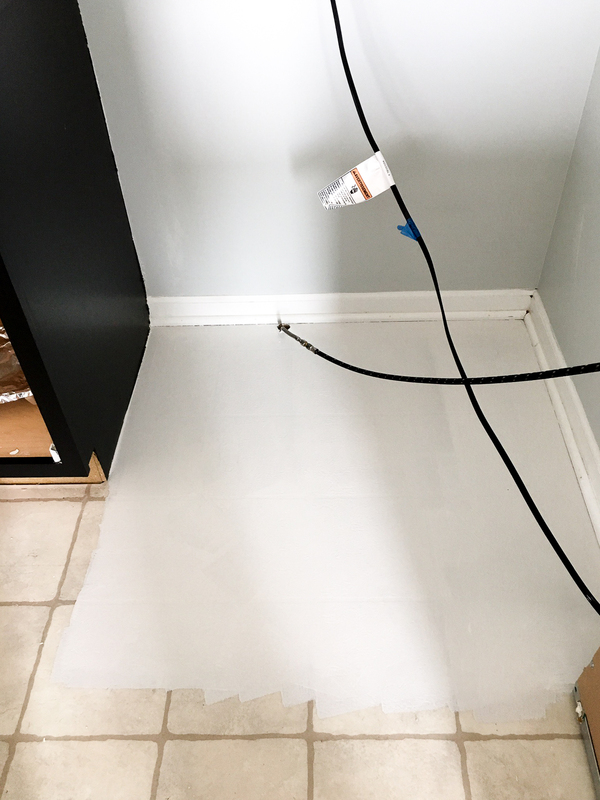 I was amazed at how well this paint was covering the floor – I almost think it was easier than painting a wall. I placed a box fan in the kitchen to help dry time but it honestly dried very quickly. 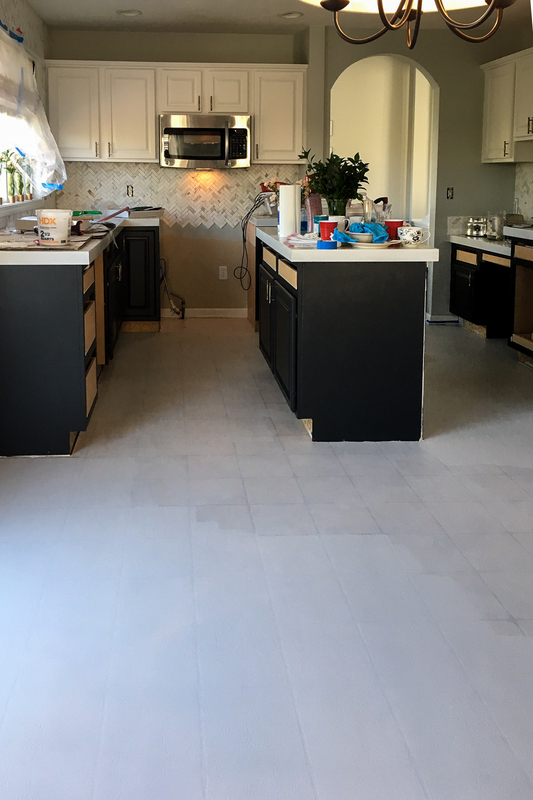 I waited about 12 hours and than I painted a second coat on the floor. yuk. what a mess. The point of this picture thought is to show you the difference in one to two coats! I had done a second coat on one area of the kitchen and then went back to do a second coat on the rest. You can clearly see the need for two coats but then again when does one coat of anything really work? You can also see the lines from the pattern of our linoleum and thats okay because the pattern of the stencil will hide those. Once your floor is totally dry (I’d wait about 24 hours from the last coat of paint) it’s time to make things pretty! 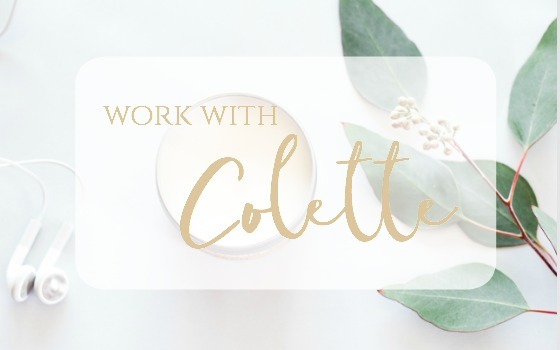 I searched the online world of stencils for days looking for a pattern that was big (which meant less work for me), made a gentle statement, and was budget friendly. 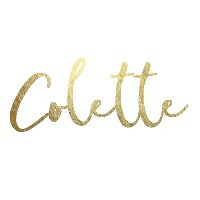 When I found the Stephanie Lace All Over Stencil from Cutting Edge Stencils I knew it was the one for me! The pattern is 19×19 which was the perfect size for alllll the floor space I needed to cover. The kind folks over at Cutting Edge Stencil partnered with me for this One Room Challenge space and I received this sweet little package of stenciling goodies. We won’t need the wall level for this project but if this were going on a wall that would be SO helpful! So…where to begin? This will depend on your space but I knew I wanted the pattern to start in the middle of our dining space in the kitchen because visually this made the most sense. 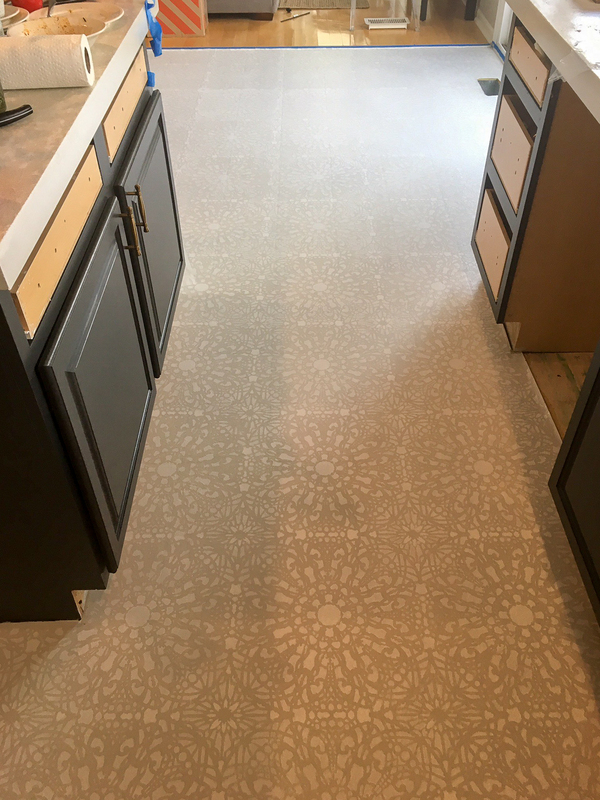 It’s best to find the middle of your floor and start the stencil there rather than on and edge because your overall pattern may not look centered. No one wants a non-centered pattern friends. 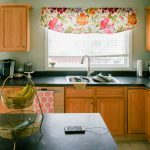 I chose my overlay stencil color purely based on using resources – we had just painted our upper cabinets white with the Sherwin Williams Pro Classic in Snowbound and that’s what I used on the floor. Later we’ll talk about sealing it but if you choose not to seal your floor (I think you should) you would also want your stencil paint to be porch and floor paint. 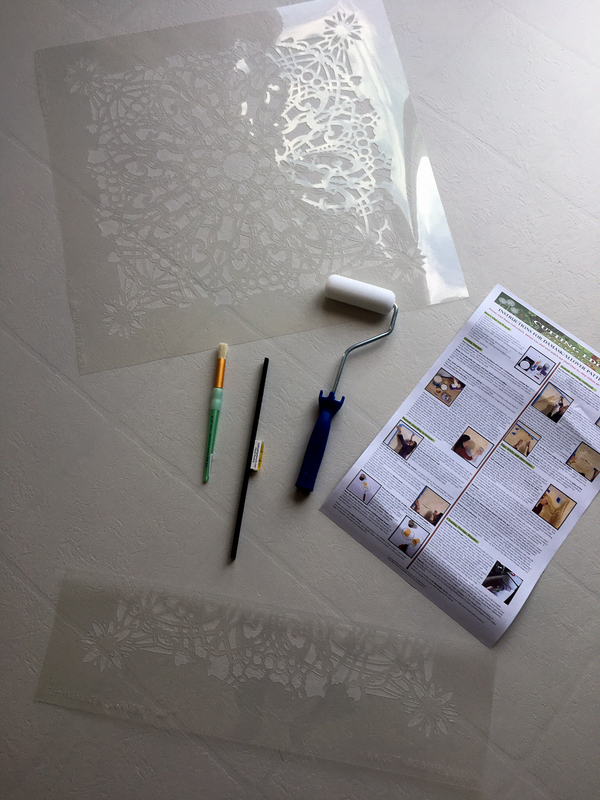 The stencils come with a detailed how to guide which was extremely helpful. 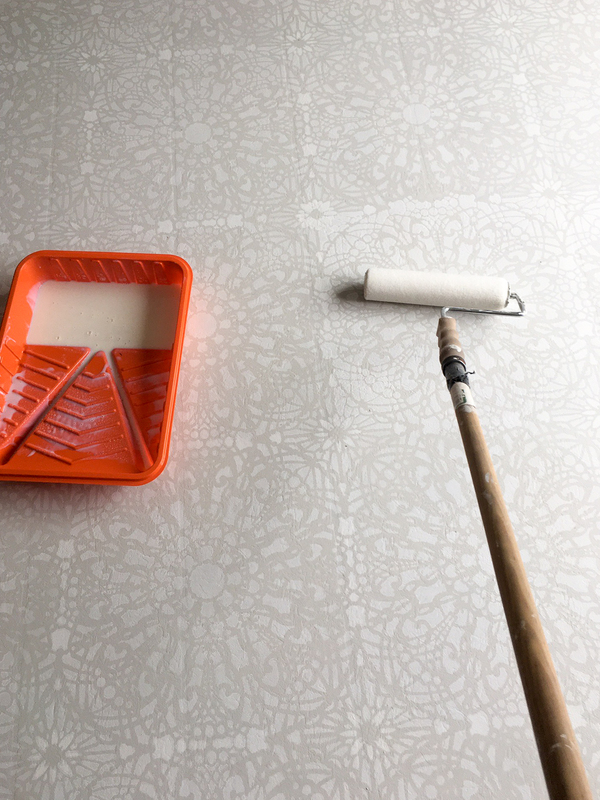 The key is to not have a lot of paint on your roller otherwise it will bleed under the stencil and you won’t end up with clean lines – the roller will be drier than you think it should be. Once I got that first square rolled I just kept moving along overlapping along the way to line up the pattern. Because no one is perfect you will see some squares where the amount of paint on my roller varied hence a darker or lighter looking stencil. But you know what? That’s OKAY! The overall floor will be amazing and no one is going to point and say ‘hey that square is darker’. 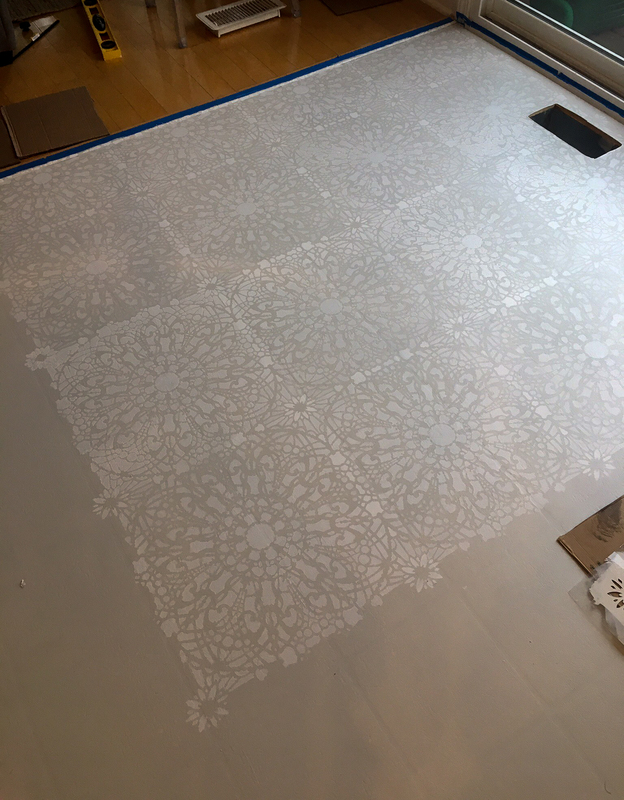 Make sure when you get to an edge of the floor or by a window or cabinet (where you don’t want paint) you place a piece of cardboard under the stencil because there will be wet paint on it. 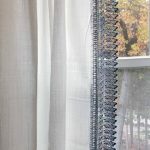 The stencil easily bends to accomodate these types of adjustments in your pattern but you’ll want to protect your surfaces. So I pretty much just worked my way around the kitchen this way! 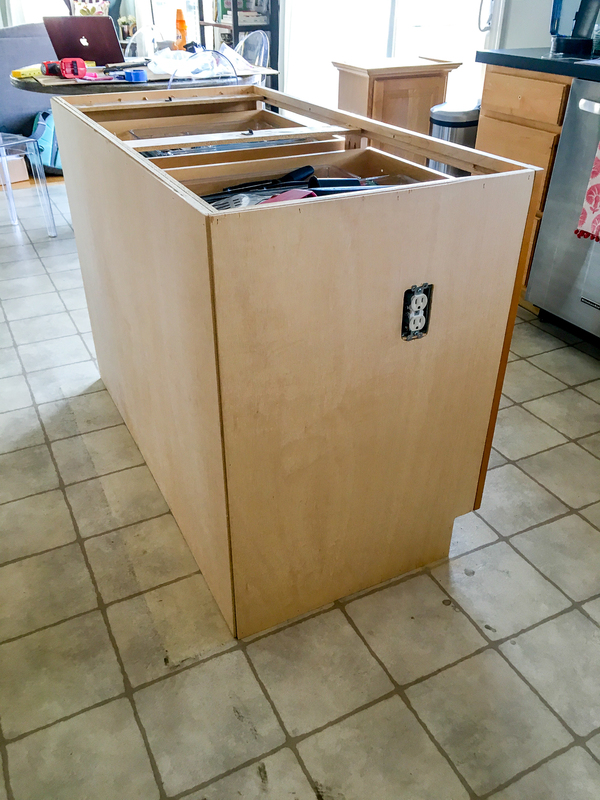 Of course things got a bit trickier around the island and cabinets but it was just a matter of lining of the pattern and rolling! I seriously had so much fun doing this! I mean talk about instant gratification! I got more giddy and excited as I went! After everything was stenciled I let it dry for about 16 hours before walking on it but because we are using such a thin amount of paint it really does dry quite quickly. 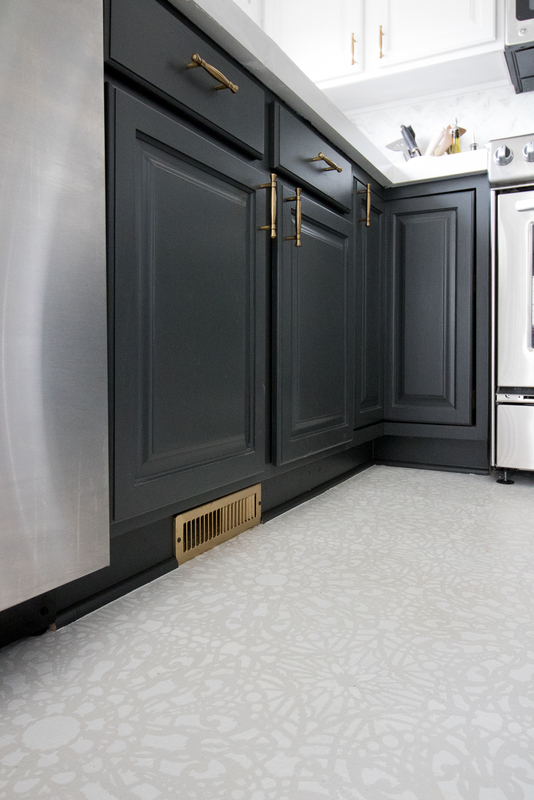 After it’s all dry we want to protect the surface from scratches and all the things that happen in a kitchen floor – plus floors normally have a shiny surface to them that feels soft on your feet and plain ol paint doesn’t give you that feeling. So I grabbed some polyurethane and a foam roller and did a nice thin coat covering the floor. Once it was dry you can see and feel a nice sheen across the floor. 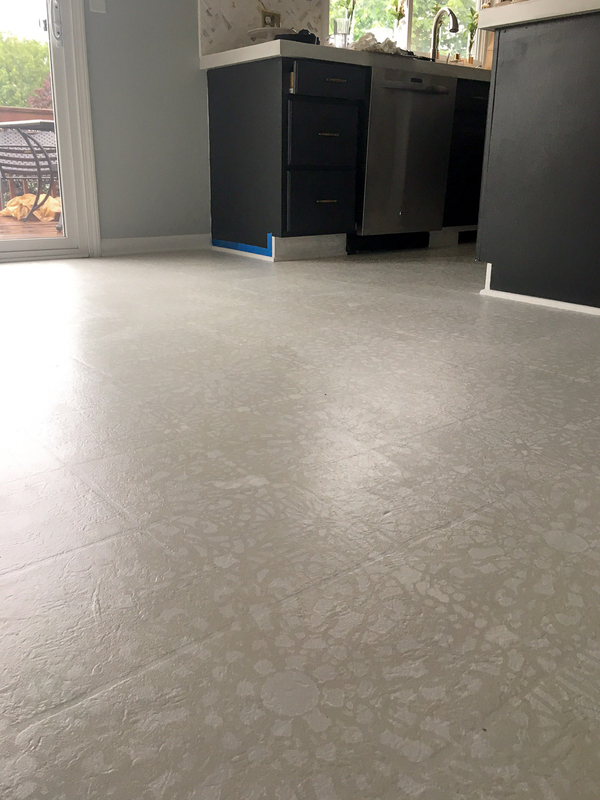 We’ve had this floor done for over a month now and I can tell you its extremely durable. 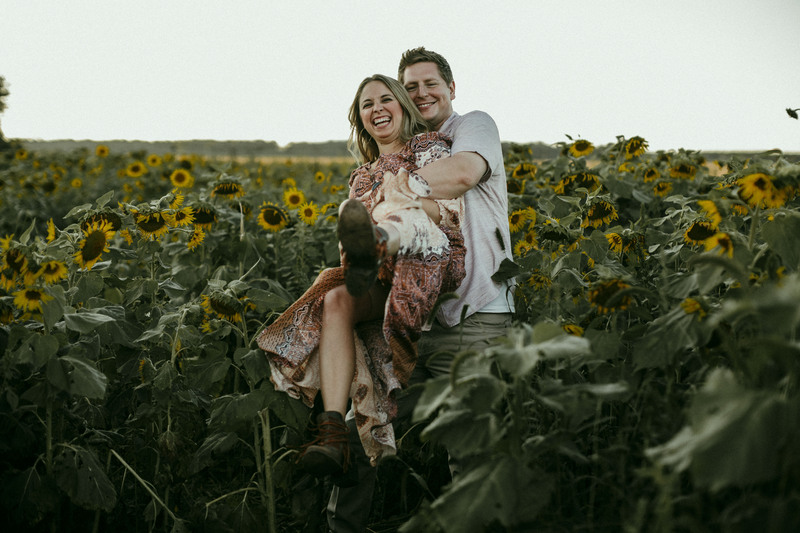 We’ve had parties, spills, and muddy shoes and the floor has held up great! I just sweep and mop with a regular mop and cleaning solution and I haven’t had the paint chip or flake at all. 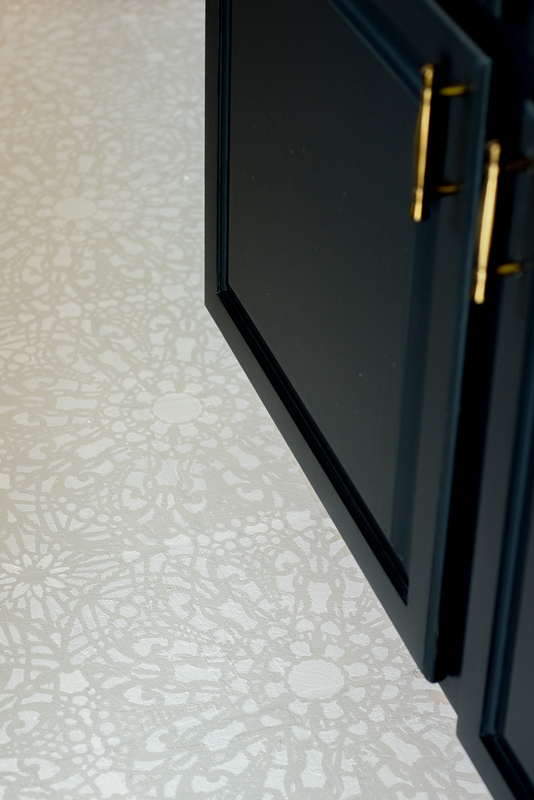 Despite us completely re-doing our entire kitchen what we get the most compliments on is this floor! With a total cost of about $100 all in you can completely transform your space in a weekend! So who’s ready to paint and stencil an outdated floor in their home?!? My sweet friends at Cutting Edge Stencil are giving one of my readers a free stencil up to $50! Hooray!! 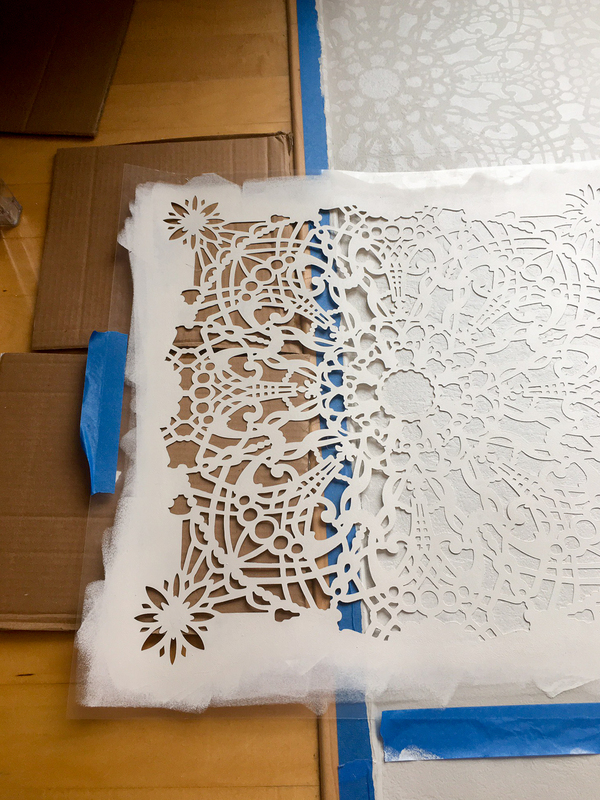 Just head to Cutting Edge Stencils and then leave a comment with your favorite stencil! (Open to US and Canadian Residents). 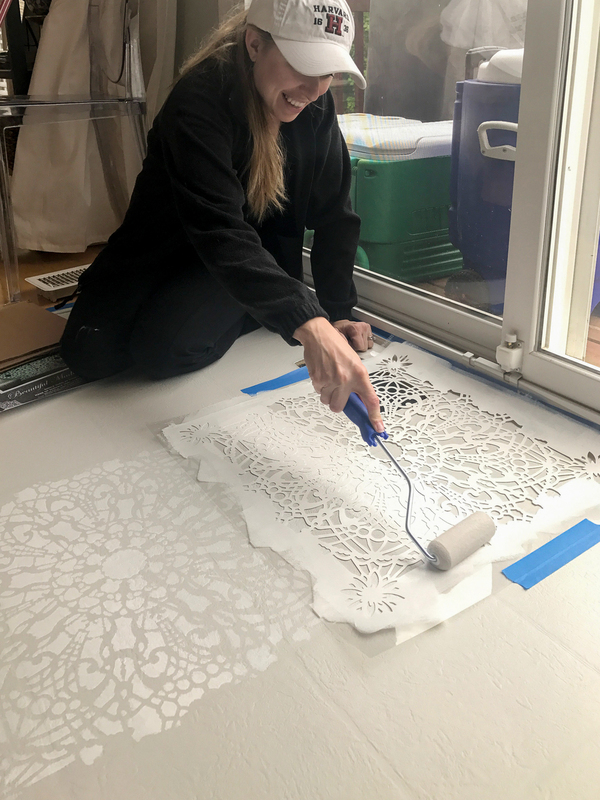 There are so many great stencil options it’d be hard to choose a favorite – but I LOVE this Stephanie Lace allover pattern. Giveaway will end Sunday June 19th at midnight EST. 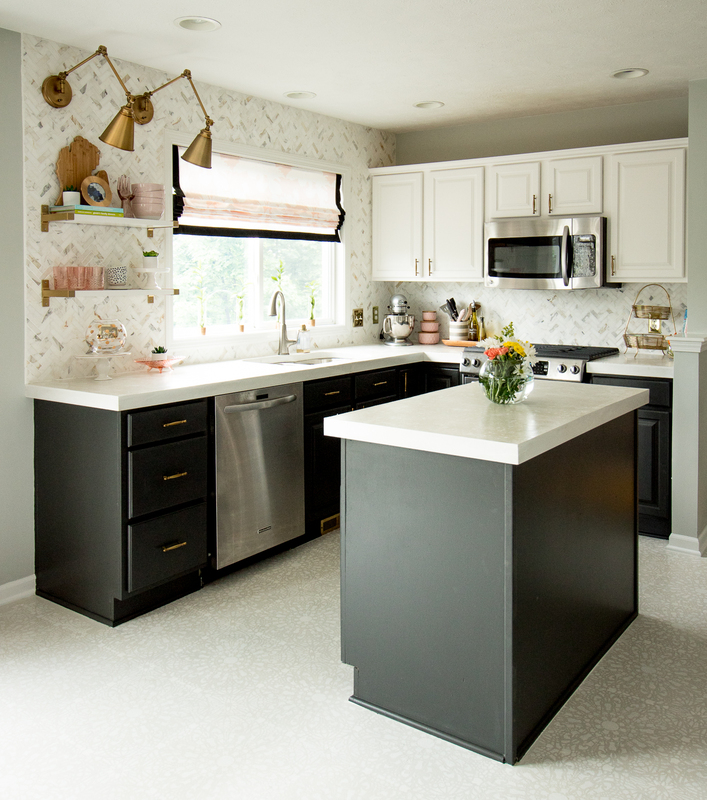 To see more of our One Room Challenge reveal head here. I can’t wait to here what your favorite stencil is! 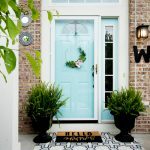 Spruce Up Your Front Porch – On A Budget! Oh I love it! You did an amazing job! I love the stacked stone wall stencil. I’d love to do something like this to my kitchen floor and walls! Thanks Lindsay! Go for it! Oh what a bummer!! Sorry to hear that! Beautiful! 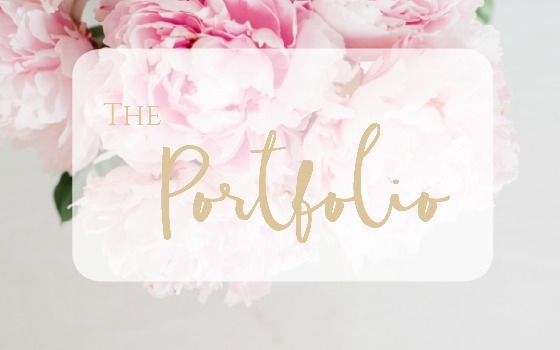 Love all things DIY! I would think this could be done to tile floors as well?